Built in 1922 to link Ironton, Ohio, and Russell, Ky., the Ironton-Lawrence Bridge spanning the Ohio River levee, six rail lines and city streets is being replaced by the Ohio Department of Transportation via an $81.4 million contract that was awarded to the Brayman Construction Corporation. The work began on March 5, 2012, which has the new bridge placed between Second and Jefferson streets in Ironton and the U.S. 23 viaduct south of Russell. The current bridge is slated for demolition after the construction of the new bridge is completed. The demolition will occur between the summer and fall of 2017. The project is being funded by ODOT's major new bridge program. In 1982, the State Bridge Commission transferred control of the bridge to ODOT. Since then, the bridge has undergone several repair projects and in-depth inspections. The bridge, under federal definitions, was deemed “functionally obsolete and structurally deficient” and identified for replacement in 1999. A project study was launched beginning in 1999, and from that point forward, ODOT worked with the cities of Ironton and Russell and consultants from Baker & Associates to develop and design the project. “The decision to relocate it came out of involvement from both cities in which Ironton wanted a downtown approach and Russell wanted it at the viaduct,” said Kathleen Fuller, ODOT District 9's public information officer. “After completing the Environmental Impact Statement and selecting a preferred alternative, the Federal Highway Administration authorized a Record of Decision for the project in 2003. However, the project was rejected for award at the time of bid letting in January 2006 due to the unanticipated price escalation that put construction cost 10 percent above the state's estimate and 22 percent over the allocated budget. In 2006, the bridge construction was tagged at $99 million, but cost savings were realized through the redesign process in which there were changes to the size and scope of the bridge, including going from a single-tower design to the two-tower structure and the elimination of a sidewalk. The new bridge is being built as a two-lane, three-span cable-stayed bridge with reinforced concrete edge girder superstructure on the main span. Approximately 10,300 vehicles per day use the existing bridge, and the new bridge will carry a similar number. ODOT studied three other bridge types: suspension (traditional and self-anchored); Trusses (deck and thru); and Arches (true and tied). “Although some of these were advanced for further study and given consideration, the cable-stayed design was selected due to construction cost, aesthetics, constructability, maintenance, serviceability and inspection,” said Fuller. The three spans that form the main span will measure 370, 900 and 370 ft. (112, 274 m) each, for a total length of 1,640 ft. (499 m), with a width of 32 ft. (9 m) The navigational clearance will be 805 ft. (259 m) The main span will consist of two Delta-shaped towers that are cast-in-place, reinforced concrete. The height will be 300.72 ft. (91 m) from the top of the towers to the river at normal pool, and 216.2 ft. (65 m) from the top of the towers to the deck at the base of the towers. The main structure of the bridge will have 120 cables —15 pairs in the Ohio back span, 30 pairs in the main span and 15 pairs in the Kentucky back span. The strands are made of steel, and the number of strands varies in each of the cables — a minimum of 14 located in the cables nearest both towers to a maximum of 35 in the cables farthest from the towers on the back span sides. The cables at the mid-span contain 31 strands each. There is one abutment and two piers on the Kentucky approach, two towers in the river and four piers and one abutment on the Ohio approach. “Pier 2 on the Kentucky approach is actually located in the river,” said Fuller. “All abutments, piers, and towers are cast-in-place, reinforced, concrete. The tallest pier is Pier 2 at 80 feet, and the widest pier is Pier 1 at 60 feet. The foundations for Towers 3 and 4, as well as Piers 2 and 5, are cast-in-place, reinforced, concrete footings on drilled shafts. 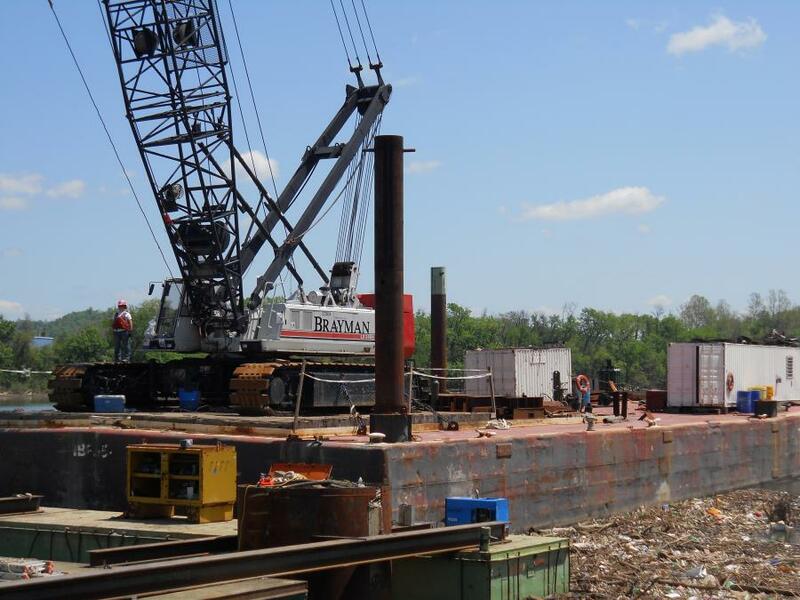 Pre-cast cofferdams will be used for Towers 3 and 4, and a conventional cofferdam will be used for Pier 2. The project also has environmental concerns that need to be dealt with, particularly wildlife. The main concern was for the peregrine falcons that nest on the existing bridge, along with the need to protect Ohio River mussels, Indiana Bats and Running Buffalo Clover. “We worked with the U.S. Coast Guard, U.S. Fish and Wildlife, the Ohio Department of Natural Resources, Army Corps of Engineers and other agencies to mitigate and resolve such matters during the design process and prior to construction,” said Fuller. Having the existing bridge in place helps to minimize the impact on local traffic and Fuller said that “traffic impacts to motorists should be minimal as most work is being conducted off the roadways.” First Street and Campbell Avenue in downtown Ironton are subject to temporary closure and intermittent restrictions for the Ohio approach construction and in Russell, heavy equipment and crews are mobilized along U.S. 23 and the viaduct at the Kentucky approach. Brayman crews have been busy, and following the Christmas break, they completed the Ohio Tower, Tower 4, which culminated with the last segment (Segment 18) cast in January 2016. After casting the final segment the Peri form system was removed and work began installing ladders and platforms inside the tower. In addition to this and the Kentucky Tower, the Ohio back span, the Kentucky back span and the Kentucky cantilever have been completed. And since moving the form traveler from the Kentucky cantilever to the Ohio side in February, the contractors have begun construction of the cantilevered main span there. The main center span 900 ft. is supported by two CIP, 316-ft. (96 m) tall, diamond shaped towers, founded on large diameter drilled shafts with rock sockets. When completed, it will be the longest main span that ODOT has built. Brayman crews have been prevailing over a variety of challenges since the start of the project. 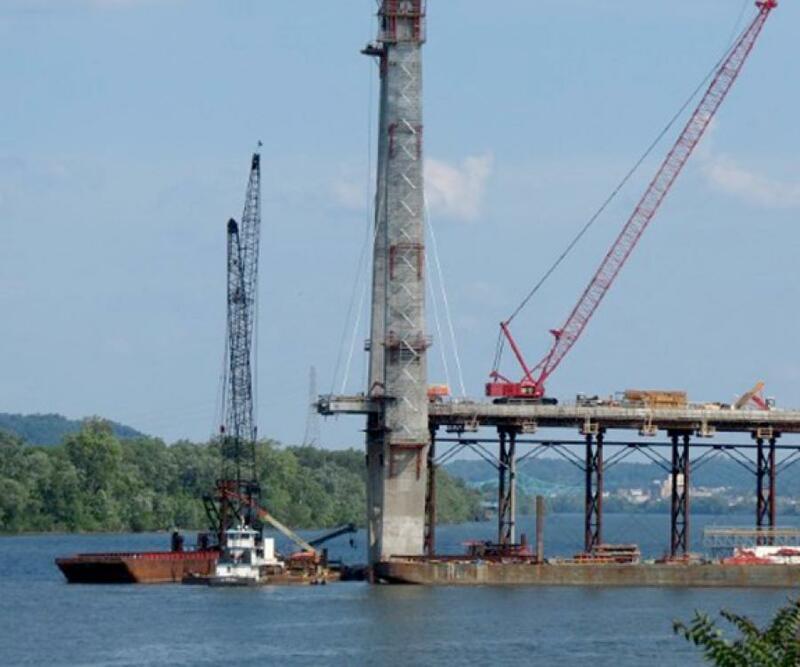 “While we can't speak specifically for the contractor,” said Brian Davidson, assistant resident engineer of FIGG bridge inspection, ODOT's construction consultant on the project, “we can say that working on a navigable waterway such as the Ohio River is challenging. In addition to safety concerns for the crews, there is high risk with the threat of flooding and valuable equipment on barges. It also requires considerable coordination with the stakeholders who use and manage the river. Utility relocations were dealt with early on this project. The new bridge is being constructed in a new location; however, removal of materials will be from demolition of the existing Ironton-Russell Bridge in which its steel structure and concrete piers will be removed. The amount of materials that will be recovered from the operation is still being determined. Materials to be used in the construction include: 18,500 cu. yds. (14,144 cu m) of structural concrete, 4.7 million lbs. (2.1 million kg) of reinforcing steel, 167,000 lbs. (75,749 kg) of post-tensioning strand, 69,500 lbs. (31,524 kg) of post-tensioning bar, 31,000 linear ft. (9,448 m) of HDPE pipe for cable stays, and more than 500,000 lbs. (226,796 m) of seven wire cable stay strand. Crews are working eight to 10-hour shifts during daytime hours, and are working on some Saturdays. The main subcontractors on the project are: J&B Steel Erectors for reinforcing steel, Boone Coleman for the approach embankment and West End Electric for conduit/electric installation.